I spent the early part of an afternoon at Nonna’s Italian Restaurant in Florham Park New Jersey. 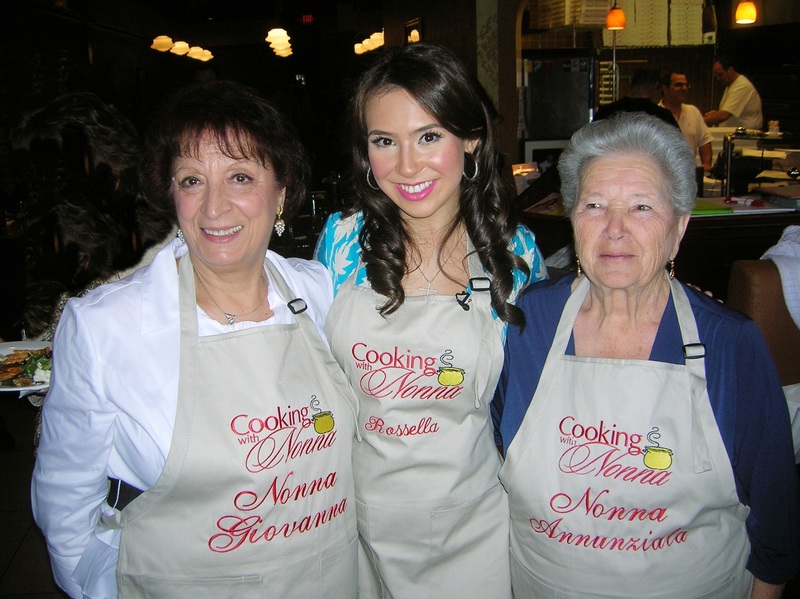 Rossella Rago was filming a webisode of Cooking With Nonna, the popular website that features Nonnas from different regions of Italy showcasing their recipes. What better way to preserve a family tradition of recipes and foods than to have a Nonna giving you lessons. Rossella Rago, along with her father and business manager “The” Vito Rago, ventured into this media in 2009, after winning first prize in the Food Network’s “24 Hour Restaurant Battle”. Rossella and her mother Angela Rago, along with “Nonna” Romana Sciddurlo , three generations of Italian women from Brooklyn, NY, kept their cooking authentic with recipes passed down through their family. It was enough to have them win the competition and realize that traditional family Italian cooking was as popular as ever. Nonna Giovanna and Nonna Annunziato take time for a photo with Rossella. The two stars of the show were Nonna Giovanna, who prepared a traditional Easter wheat pie (Pastiera Di Grano) and Nonna Annunziato who cooked up Pizza Rustica. It was a delight watching Rossella hosting the demonstration as she tackled mixing the dough with her hands, which she says herself is not her forte, and keeping the program moving and entertaining. And the best part of all was that we got to eat the delicious pies that were made at the demonstration and prepared ahead of time for the large crowd. The two following recipes are courtesy of Nonna Giovanna and Nonna Annunziato. They have been prepared this way in their family for generations. One of my reasons for starting this blog was because I wanted to share the recipes my family prepared and carry on the traditions of delicious food with others. Rossella Rago is doing the same thing by bringing the recipes of generations past to her modern audience. I hope you enjoy them! Yours truly with Rossella Rago, keeping traditions alive. In a pastry blender or food processor, beat eggs and sugar together. Then, mix flour and baking powder and add to the egg mixture. Mix everything together. Then, add the melted butter, milk and vanilla. Mix it well. Remove the mixture from the pastry blender or food processor and turn onto a lightly floured board or counter. Knead the dough until smooth. Form into a ball and set it aside for a short while. Then, roll out the dough, approximately 1/4 of an inch, and line the bottom of the pie tin, cutting the excess dough around the edge of the tin. With the remaining dough, cut out long strips and set aside for decorating the top of the pie. The night before preparing the wheat pie, soak the 1 pound of wheat in water. The following day, in a large sauce pan, cook the wheat in the same water with salt and grated orange peel, butter and orange juice until very soft. Add sugar and let it melt. Then, add ricotta, half-n-half, limoncella, nutmeg and cinnamon. In a separate bowl, beat the eggs and fold them into the wheat mixture. Stir everything well and beat until smooth. Drop the mixture into the buttered crusted pie tin. Then, place strips of dough crisscross over the filling to the edge. Roll bottom overhand up and over strips and press firmly. Preheat the oven and bake the pie at 350 degrees for 1 hour. Let it cool. Before serving sprinkle the wheat pie with confectioner sugar. Make a well with the sifted flour. Add all other ingredients. Mix until resembles a dough ball. If dough is too soft, add flour. If dough is too hard, add warm water. Knead dough until smooth. Set aside and keep warm in a kitchen towel for approximately 2 hours. Combine all ingredients in a mixing bowl. Mixture should not be too soft. Set aside. Roll out 1/2 of the dough with a rolling pin. If the dough sticks to the pin, coat it with flour. Lay the dough onto a 16″ pizza pan. Put the ricotta mixture onto the dough, leaving a 1″ lip clear of mixture. Line the top of the mixture with the slices of sopressata, press into mixture. With a pastry brush, put warm water around lip. Roll out the other 1/2 of dough. Put it on top and press ends together with the tips of a fork. Beat one egg in a mixing bowl. Brush egg over the pie. Poke tiny holes in pie, before placing in 350 degree oven. Pie cooks in approximately 40 minutes or golden brown, both top and bottom. This entry was posted in Antipasto, Dessert, pizza, Ricotta and tagged Cooking with Nonna. 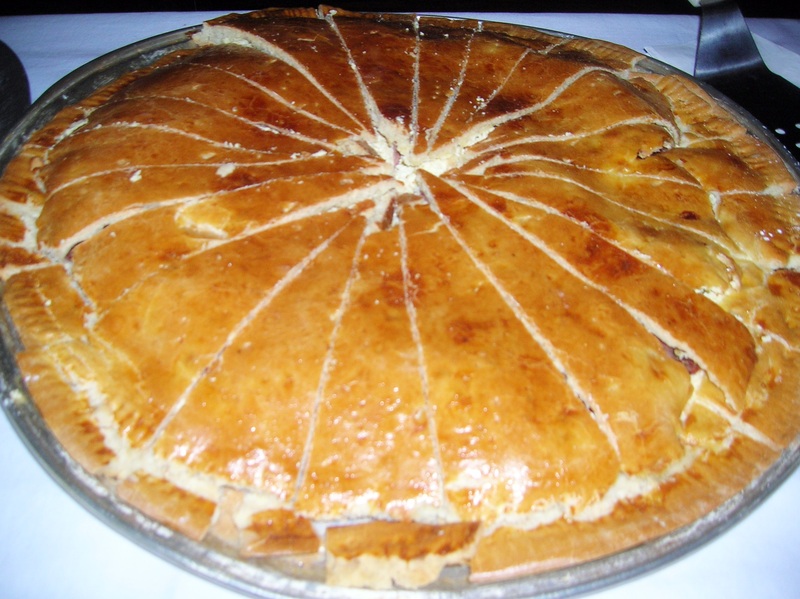 Rossella Rago, pastiera di grano, pizza rustica. Bookmark the permalink. Can’t get those wheat berries………..and I’m drooling over your recipe. It was a favorite of mine growing up. My mother would make it for me when ever she found those berries through the year. Thanks for all you bring to us… as you share and get each recipe available for us. I’m thrilled. It’s hard to get that wheat unless you live near an Italian area with good Italian stores. You can always order it online. My parish was Our Lady of Guadalupe but I remember St. Bernadette’s well on 82nd Street and 13th Avenue. The bakery across the street is still there, next to the post office. I picked up some goodies from there just the other week. You must also remember Sirico’s and Romano’s. I was too young to remember them. Did you church have flowers galore during the week before Easter. I can remember being taken to one church after another. I don’t remember what day it was though… couldn’t have been Good Friday…. maybe Holy Thursday? I remember being in awe of the complete artistic beauty of how the adorned the altars. Wish I was older before we moved. You can get Summer and Winter Wheat at any local health food store that carries fresh grains and nuts…..